Despite my unhealthy obsession with cereal, both in the “affecting my mind” and “affecting my body” aspects, I pretty much draw the line at following cereal sales. So I was kind of surprised to see they still make Jif Peanut Butter Cereal. I wasn’t a big fan. I get the appeal, to be sure, but it just seemed like a cereal that didn’t have a huge audience. It seemed like Jif would come out, people would go “Huh, there it is.” and we’d all move on. Over time I did grow to really like the box art. Its almost aggressively dull retro aesthetic became something to respect. Instead, two years later, Jif still exists and is getting a line extension – Jif PB&J Strawberry. That name sure is awful typed out like that. 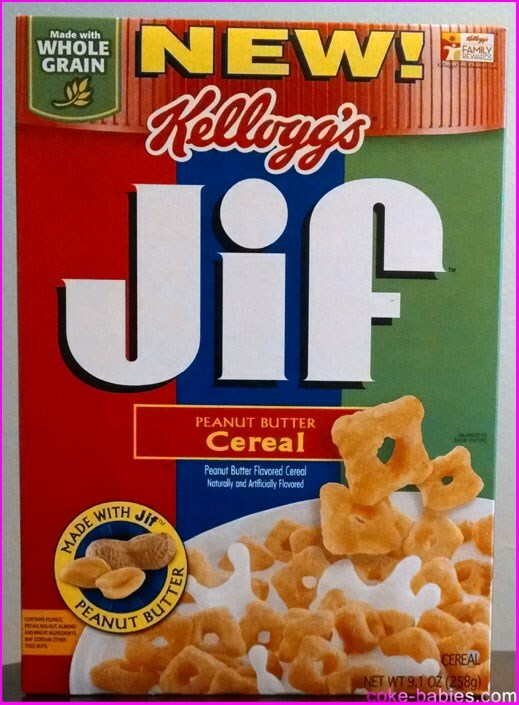 Jif kept its 1982 cereal-piece-shapes. But instead of going for a more odd shape for the jelly pieces, it went with the tried and true Crunch Berry shape. The color of the jelly pieces seems abnormally bold, in contrast to the very blah coloring of the peanut butter pieces. On their own, the jelly pieces look like your typical “red” berry piece, but mixed in the bowl they almost look nuclear. Side Note : I finally replaced my previous camera, so this is hopefully the last review where the cereal looks like blurry, off-colored terribleness. Since I already knew what the peanut butter pieces tasted like, I first tried the jelly pieces on their own. And they were good. They were either the same flavor as Crunch Berries, with maybe 10% more “natural-ness” flavoring added, or it’s just Kellogg’s approximation of actual Crunch Berries. In any case, no problems there. Mixed together, as the cereal is presumably intended to be eaten (since it comes out of the box that way and all), it is a really good cereal. The understated, more “real” flavored peanut butter pieces mesh perfectly with the “fake berry” jelly pieces. Instead of the opposite ends of the spectrum clashing, they just meet in the middle. If you liked the original Jif cereal, I don’t see why you wouldn’t like this one (unless the dilution of the peanut butter purity is too much to handle). If you weren’t a big fan of it, it’s worth a shot. Pebbles seems to be challenging Cap’n Crunch when it comes to random brand extensions. Not long after introducing Poppin’ Pebbles, they release a limited flavor – Summer Berry. 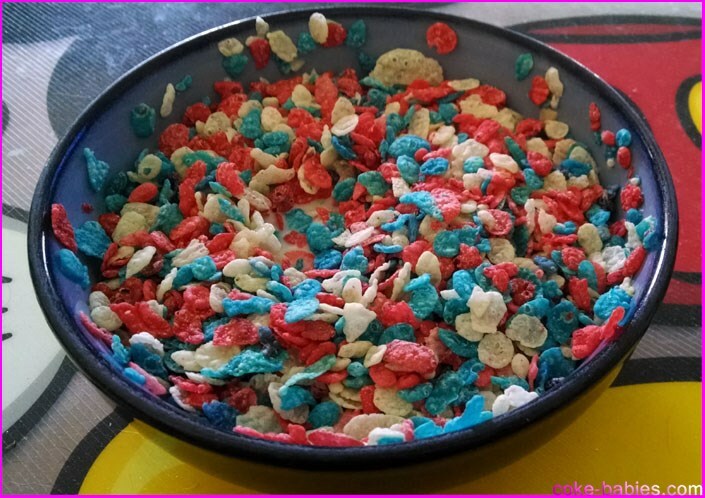 The downside to this cereal being Pebble-theme is, Pebbles and Bamm-Bamm are boring. Pebbles is just kind of there, and Bamm-Bamm has mutant strength yet doesn’t fight caveman crime. 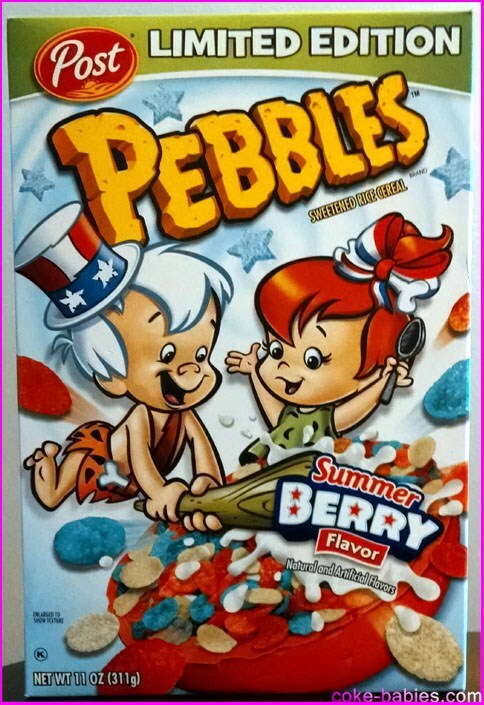 Although at least Pebbles makes sense – she has red hair like Wilma. Bamm-Bamm’s white hair makes you assume that his mutant powers gave him some physical abnormalities besides the strength. That or the more obvious assumption that Betty wasn’t very faithful. The box reads Fourth of July pretty well, although the abundance of white and very light blue gives it a more immediate impression of being winter themed. I don’t know if the cereal tastes exactly like Poppin’ Pebbles, minus the exploding boulder things, but from what I remember it is similar. They both had that strong, unpleasant, almost medicinal initial scent. The first impressions of the flavor was similar as well – not that good at first, but you get used to it and it averages out to a decent bowl of cereal. Visually, it’s nice – the red and blue are very vibrant, letting you know that the coloring is sure to be all natural. But overall? Eh. It has the downsides of Poppin’ Pebbles without the fun novelty. It’s not bad, just forgettable, and definitely an inferior sibling of the original Pebbles cereals. I was rather confused when I saw the box for Jif Cereal. First, the design just looks old. I know it’s based on the Jif label, but still, it looks like a box of cereal from the 70’s. Especially since Jif isn’t exactly a hot commodity right now – it’s just sort of there. I know choosy moms have been supporting Jif for a long while, but they might not be the trend-setters they think they are. Not helping the situation is the not particularly attractive cereal pieces taking up a good portion of the box. The cereal itself doesn’t really look like a cereal that should be made any more. It just looks… old. The shape seems arbitrarily chosen, and the shade is sad looking – it’s not even close to the same shade as actual peanut butter. But the taste is what really counts, right? And the taste is pretty good. I’m coming to the conclusion that with cereal, the more “real” the peanut butter flavor is, the less I enjoy it – especially in the long run. Cereals like Peanut Butter Cheerios and Peanut Butter Toast Crunch tasted great at first, but quickly grew tiresome to me. I’ve never bought a second box of either. Meanwhile I love the less authentic representations of the flavor like Reese’s Puffs. I also love the flavor of Peanut Butter Crunch, but I lack the jaw of Trap Jaw from Masters of the Universe to be able to chew through those rock-hard pieces. Overall, the flavor is good. It’s not as super peanut butter-y as some other peanut butter cereals, which is ironic given the brand it’s attached to. It finds a pretty comfortable middle ground between authentic taste and “cereal” taste. It kept its crunch for a reasonable amount of time, and flavored the milk a little, just so you knew it was there. Will I buy another box? Probably not. But I do think it was good enough to check out to see if it’s up your peanut butter alley. 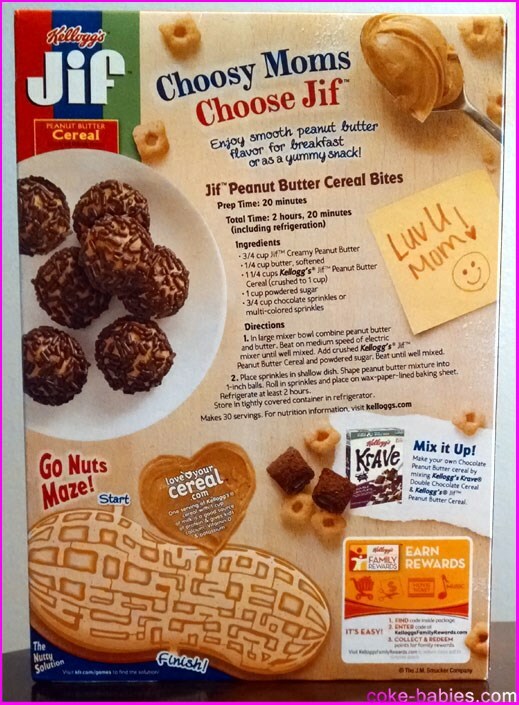 On the back of the box for Jif Cereal, they suggest mixing it with Double Chocolate Krave, to MacGyver your own chocolate and peanut butter cereal. This sounded like a pretty awesome combination. 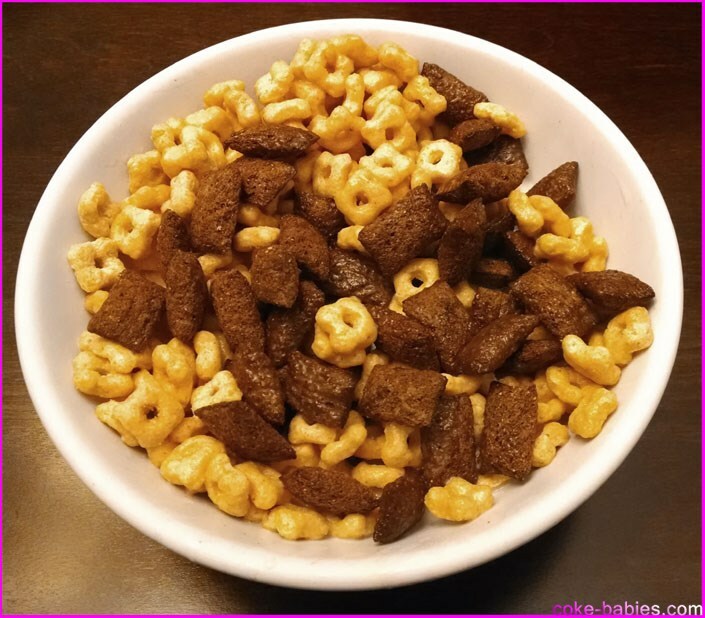 Double Chocolate Krave is one of my favorite chocolate cereals in a while, and while the shapes aren’t identical, it seemed like they’d blend together pretty well. The Krave pieces were bigger than the Jif Pieces, which surprisingly hurt the mixture more than you’d think. It took actual effort to balance the spoonfuls, since even after thorough mixing I kept winding up with almost all Krave or all Jif on the spoon. But I persevered through these hardships to determine the flavor. In the end, it was okay. 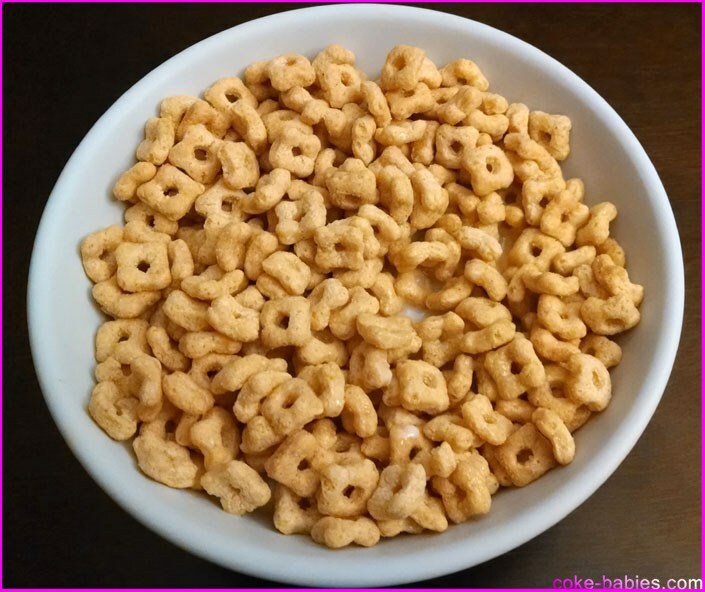 The flavors didn’t really go together that well – it just made me wish I was eating the cereals separately. What I think would be a much better solution would be to use Quik instead of milk when you have a bowl of Jif Cereal. I think I might have to try that.